The Israeli government is currently banning all non-Muslims from ascending the Temple Mount, considered the holiest site in Judaism. “It seems freedom of religion in Israel is only for Muslims and not for Christians and Jews,” Danny Danon, deputy speaker of the Knesset, told KleinOnline, referring to the new restrictions. Jerusalem Police spokesman Shmulik Ben Ruby confirmed to KleinOnline that Jews and Christians are entirely restricted from entering the mount due to safety concerns over the main access gate for non-Muslims, known as the Mughrabi Bridge. 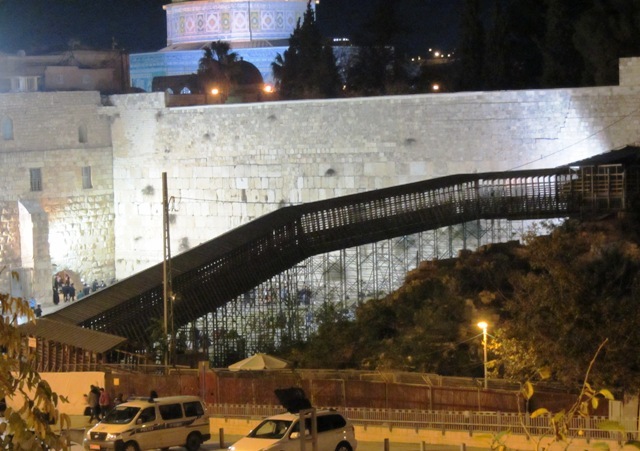 Yesterday, Jerusalem Mayor Nir Barkat officially ordered the bridge to be indefinitely closed due to petitions from the city’s Antiquities Authority citing fears the weakened wooden structure may collapse or catch fire. There are 15 gates leading into the Temple Mount compound, 10 of which are in use but for Muslims only. The Mughrabi Gate, located at the Western Wall plaza, is the only access for non-Muslims to enter the site, meaning its closure now prevents Jews, Christians and any tourists from visiting until a replacement structure is built. Ben Ruby said there are no immediate plans for any of the 10 entrances to the Mount to be opened for non-Muslims, citing security concerns. A replacement bridge could take several months to build. Arab countries are already warning any construction in the sensitive area could lead to violence, claiming the Jewish state is using the bridge renovation to threaten the al-Aqsa Mosque, located on the mount. “This is a serious step that shows the Zionist scheme of aggression again the Al Aqsa mosque,” Hamas spokesman Fawzi Barhum told AFP today. Knesset Speaker Reuven Rivlin said the Israeli government received warning messages over the bridge reconstruction from the Egyptian and Jordanian governments. “The Muslim Brotherhood is exerting pressure on them,” he said of Egypt. The Mughrabi bridge is in serious need of repair. It was scheduled to be demolished and replaced with a sturdier structure, but Prime Minister Benjamin Netanyahu instructed the Jerusalem municipality two weeks ago to postpone the demolition due to the sensitivity of the issue and warnings from Egypt and Jordan. Danon, from Netanyahu’s ruling Likud party, told KleinOnline he spoke with the prime minister today about finding a solution to accommodate Jewish and Christian visits. “I believe we will see in the near future non-Muslims will be allowed to go back on the Temple Mount,” he said. Meanwhile, nationalist politicians and Temple Mount activist groups here are strongly protesting the new restrictions. “However, there is a vital need to build a replacement bridge,” he added.